Landscaping works around Novodevichy Convent and the surrounding streets have been recently completed. These works took place at the Novodevichy and Luzhnetsky driveways, Novodevichaya Embankment and at Frunzenskaya Embankment from Hamovnichesky Val Street to Andreevsky Bridge. The new pedestrian route from Novodevichy Convent to Luzhniki Stadium has been created as a result of the streets’ transformation. All the works in Khamovniki were a part of the My Street program. Its main objective is improvement of streets in all districts of Moscow and creation of an enabling environment for pedestrians and cyclists. All these streets have got widened sidewalks, new lighting and benches. In addition, 15 parking pockets for cars and parking space for 25 tourist buses. 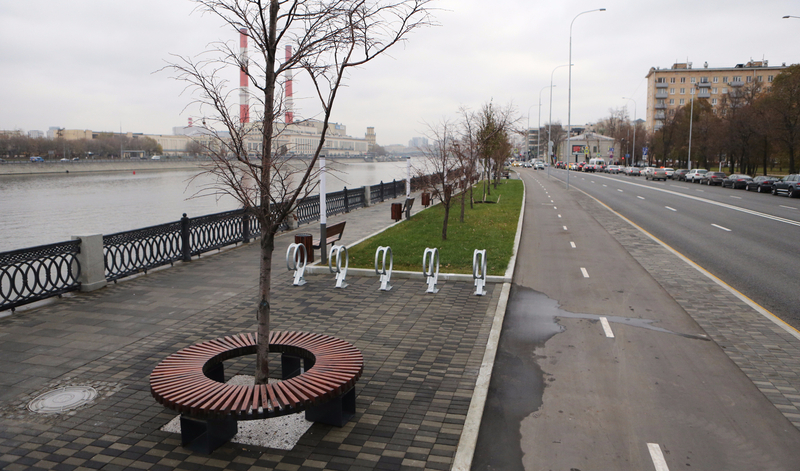 Besides, there have appeared new bicycle lanes and 26 parking places for bicycles. Facades of 19 buildings were put in order. Eight of them had architectural and artistic lighting installed. At the same time, overhead cables and wires were transferred to the underground cable drain.